An aerial view of Fort Baxter in GTA Vice City. Fort Baxter Air Base is a national guard military base in Vice City in Grand Theft Auto: Vice City and Grand Theft Auto: Vice City Stories. 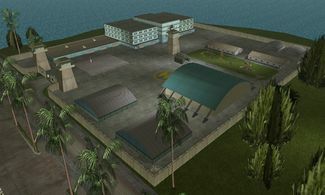 Located on a peninsular bordering the grounds of Escobar International to the south, the air base is initially part of the Escobar International district in GTA Vice City, but becomes an independent district in GTA Vice City Stories. The base is known simply as Fort Baxter in GTA Vice City Stories. As implied, Fort Baxter is a multirole military installation that provides accommodation and training for recruits, stores military equipment (most prominently military vehicles), and serve as a operations center for military deployments from Vice City. In both GTA Vice City and GTA Vice City Stories, the base roughly contains barracks, hangers or garages, and a massive administration building, but the general configuration of these buildings differ between games. Fort Baxter is a heavily guarded area where a large numbers of soldiers wander around with armed with M4s, making it extremely dangerous for the player to gain access to the base; the military defenders may have a shoot-on-sight policy, regardless of whether or not the player is armed. Furthermore, soldiers will occasionally attack the player in GTA Vice City when they simply pass by in the street outside, even though the player is technically not trespassing on the base itself. For this reason, extreme caution should be used when in the area. Soldiers will also shoot any PIGs or other gang members that appear either on the road in front of the base or in the base itself (the latter only if the player has modified the pedgrp.dat file to add gangs to the airport area), with the exception of the Vercetti Gang; they will only attack Vercetti Gang members when a Vercetti Gang member accidentally shoots a soldier. The base as a whole has no prominent role in GTA Vice City's storyline, serving more as a curiosity for players who are simply exploring the city. The base's layout can be summarized as follows: The base's main courtyard, where ground-base military vehicles are parked, is located directly behind the base's main entrance, with the administration building is situated on the northwestern corner. The base's three hangers can be seen on the southeastern portion of the compound, while two barracks (complete with a significantly detailed obstacle course) are found on the northeastern corner. These facilities are separated by fences which can only be crossed by walking around them or finding a gate. Three heavily reinforced guard towers, two at the entrance, and one between the administration building and obstacle course, tower over the compound. Except for one behind the front sign, there are no hidden packages within the base, but there are accessible military vehicles, including the Rhino and the Hunter. Even so, stealing them with so many soldiers in the vicinity is no mean feat. The Hunter is particularly secure, as it is located at the rear of the base, behind many fences that need to be circumvented. Landing a helicopter (e.g. Maverick) next to the Hunter and then quickly jumping on board is one tactic to obtain the coveted attack helicopter. It is worth noting that Fort Baxter, like the Washington Beach police station, can be entered freely if the player is wearing the cop outfit, giving very easy access to military vehicles located inside. It is also worth noting that attacking a soldier will cause all the soldiers to attack the player regardless. The main entrance into the base, complete with its sign and military insignias, and a pair of looming watchtowers. The base's courtyard (foreground) and hangers (background). The base's administration building (background) and training ground (complete with an obstacle course). Aerial view of Fort Baxter in GTA Vice City Stories, as viewed to the northeast from the southwestern corner. For GTA Vice City Stories, set two years before events in GTA Vice City, the airbase's internal layout is significantly redesigned. Early in the game, corporal Victor Vance was stationed at Fort Baxter (living in a barracks) until his dishonorable discharge when Sergeant Peppah found marijuana hidden under Victor's bed. After re-unlocking the Army Fatigues however, the player can enter the base any time and he gets the same treatment as he did during his time in the army that includes aiming at soldiers and killing them until the limit of 3 is reached and then every new set of soldiers spawning will start shooting at him. The layout of the base has been virtually redone, providing the player easier accessibility around the base. Six newly designed barracks are laid out in two rows on the northeastern and southeastern sides of the base, while three hangers or garages, one of which is accessible, are sandwiched between the two rows of barracks. An infirmary, where a health pickup can be found in front, is located in the southeastern barrack; a warehouse is also placed on the west side of the southeastern barracks. The only major building which position is unaltered is the administration building; even so, the building receives significant cosmetic improvements, with redesigned facades and furnishing on the roof (featuring massive satellite dishes and a radio communications tower). In addition, security at the main entrance into the base is more substantial and cannot be broken, as two steel gates and a guardhouse substitute the breakable pole gate in GTA Vice City. The watchtowers around the base are also generally smaller and less bulky in design. Like in GTA Vice City, military vehicles spawn within the base, but are available from the start of the game as the player begins within half of the city where the base is in. The only exception is the the Rhino, which can only be unlocked after "Last Stand". The main entrance into the base. The redressed administration building, fronting a lawn square. Three of the base's six barracks on the southeastern side; Victor's former barracks is the first building to the foreground, while the infirmary (with a Red Cross on the roof and front) is the last. The base's three hangers or garages. The "ghost tower" is a coined name referring to an air traffic control tower that was originally intended to be located within Fort Baxter in GTA Vice City. The building was removed prior to the game's release. It seemed to be meant to serve a runway at the base that was also cut pre-release. The low level-of-detail building, visible in both GTA Vice City and GTA Vice City Stories, can only be viewed before entering the mainland, before the loading screen of the mainland. The tower will not be visible if the player enters the mainland. A video depicting the tower's presence can be viewed here. The tower remains in the GTA Vice City Stories rendition of the city. The image shows the preloaded mainland (top) with the "ghost tower," which is nothing more than a low level of detail model, and the loaded mainland (bottom). The same tower in GTA Vice City Stories, as seen from over Starfish Island. This page was last modified on 3 January 2015, at 05:39.